By Nancy Farrell on December 30, 2010 Visit Nancy's Website. Well, it is time to start thinking and planning our flocks for 2011. The e-mails have started telling us that spring orders for chicks may now be placed. If you’ve read some of my past posts you’ll know that for 2010 we got a variety of chicken breeds to see which of them suited our family and situation best. Looking at our hens we’ve found that the Orpingtons and Plymouth Rocks are two of our favorite breeds. For this blog I’m going to focus on the Plymouth Rock while we decide if this is one of the breeds which we will expand our flock with in 2011. The Plymouth Rock breed is an American breed established sometime in the mid-1800s. The first color variation established was the Barred variety with White, Buff, Blue, Black, Silver Penciled, Partridge and Columbian coming later. They have single combs, yellow legs and lay brown eggs. They are large birds who tolerate confinement but enjoy free ranging and the winter does not slow down their egg production, they lay about 200 eggs per year. The average rooster weighs 9.5 pounds while a typical hen weighs 7.5 pounds. These birds are dual purpose birds good for both eggs and meat. In fact, the White Plymouth Rock Hen was crossed with Cornish Roosters to get the Cornish/Rock cross that dominates our American supermarkets today. From our own experience we know that the Plymouth Rock is a very inquisitive bird with a friendly temperament. They are inquisitive but very quiet. These traits make them a perfect bird for backyard flocks, as they are not frightened by the hubbub of a household and they are quiet for the neighbors. In fact, to pick our backyard pet chickens, as opposed to our farm chickens, we selected the friendliest, most curious chicks from our 25 chick variety pack to stay at our house. Of the four selected, three were Plymouth Rocks, two white and one barred. 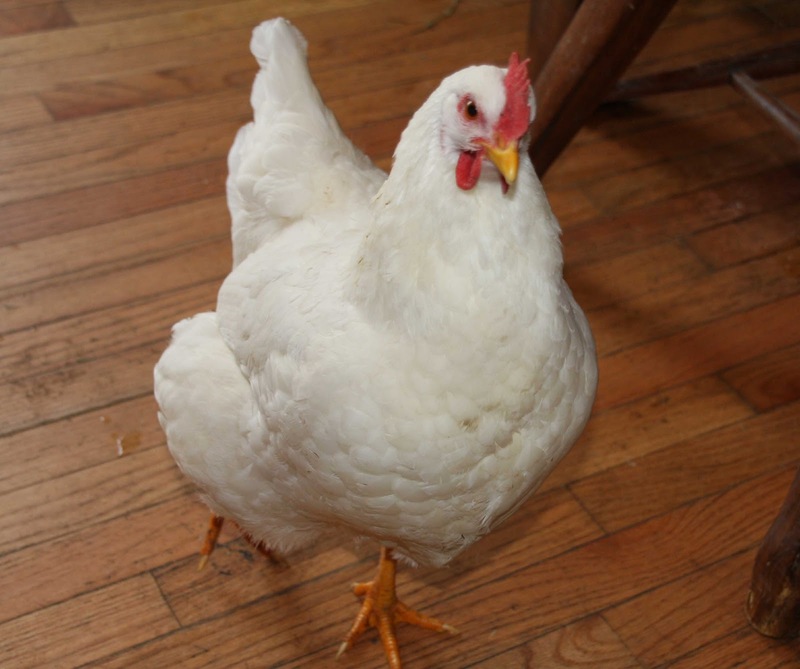 Mini, a White Plymouth Rock, is one of our favorite hens. She loves to run inside when we open the back door to let the dogs in; she has found that she can sneak in under the Golden Retriever and we don’t even see her. She then systematically checks the house for crumbs that the dogs may have left behind. When my teenage son is home she follows him everywhere he goes. At the farm one of our other favorite hens is Laverne, who is a Barred Plymouth Rock. She helps rule the roost and has established herself as one of the top hens and was the first one in her age group to start laying. 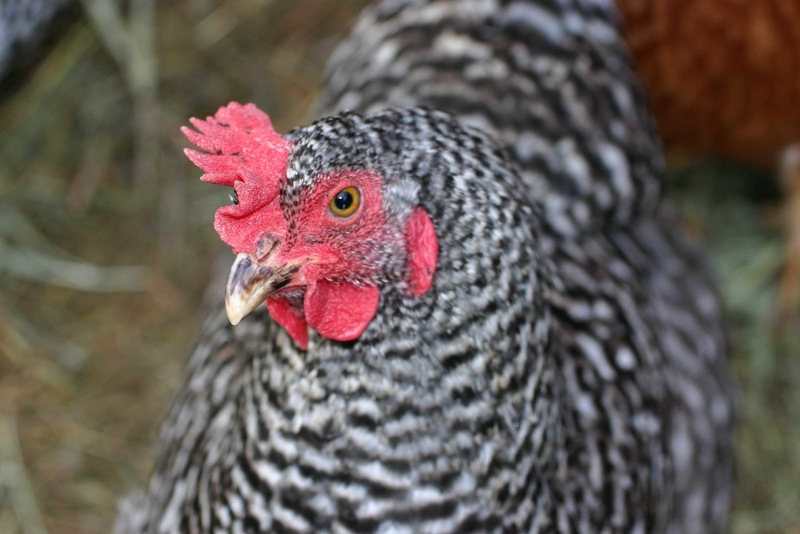 Classified as recovering by the American Livestock Breeds Conservancy, it appears that this is a very popular breed for new backyard chicken keepers. I’m pretty sure we’ll be ordering more soon! For those interested in learning more about this wonderful breed, check out the Plymouth Rock Fancier Club of America and/or the Plymouth Rock Club of the UK. For those wanting to order some of these wonderful birds they are available from most major hatcheries, including McMurray and My Pet Chicken, which is where we obtained our hens. Do you sell chicks or where should I look to find some? Most of our 2010 flock, Mini included, were hatched on June 7th. Mini is beautiful! How old is your 2010 flock? The White Rock hen is beautiful.. Too funny that it sneaks in with the dogs! We have also been happy with our Barred Plymouth Rock hens. They are indeed very inquisitive, yet not flighty. The largest of them is the leader of our flock and keeps the other girls in line. I know that when we look to expand our flock at 1840 Farm, we’ll be adding a few more Barred Plymouth Rocks to the mix.